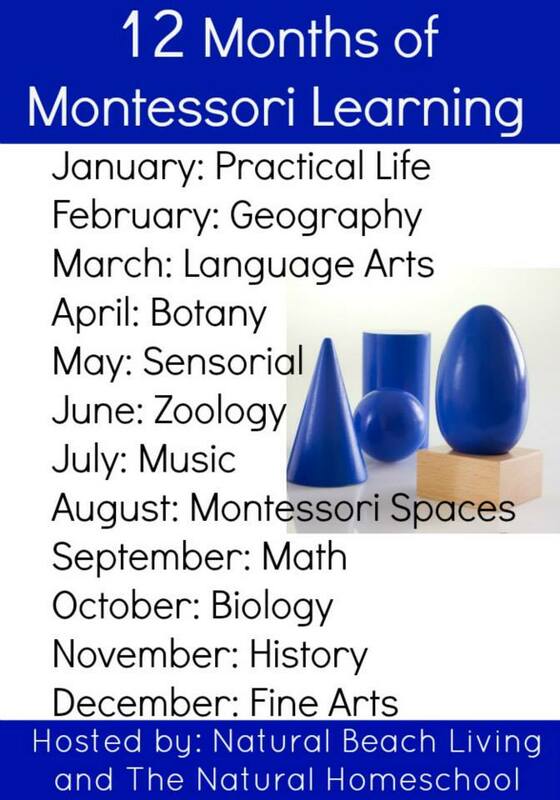 Welcome back to the third month of the 12 Months of Montessori Learning series! The first month was Practical Life Skills and the second month was Geography. 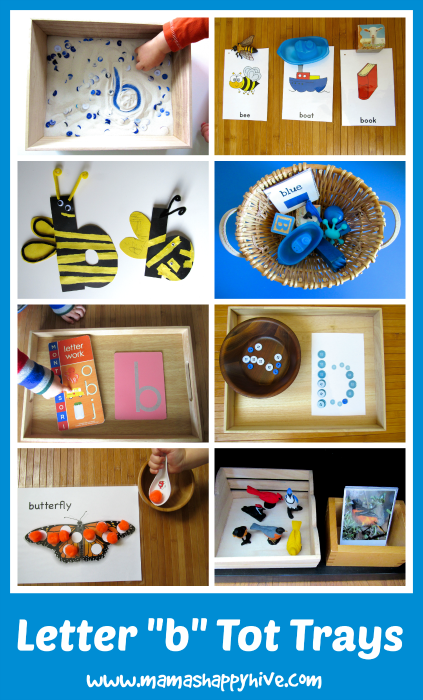 This month is on Language Arts, so I decided to create a Montessori inspired letter B introduction for Little Bee. Several of the activities in this unit were inspired by the letter series on the Kavanaugh Report blog. This study was tons of fun for me to put together and I will admit that I went a bit overboard with all these "B" activities. What can I say... both Little Bee and I loved this unit study. So grab a snack, sit back and enjoy all these activities! 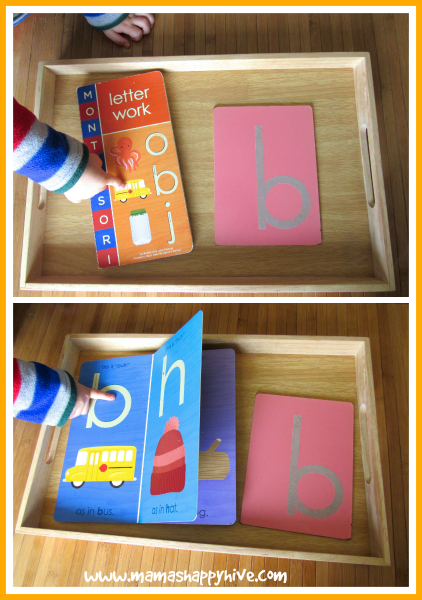 Montessori Letter Work and Sandpaper "b"
I introduced the sandpaper letter "b" and this fun Montessori Letter Work book to Little Bee. I didn't have him trace the letter b with his finger yet as he is only 2 years old, I simply set these out on his shelves for him to look at and touch when he wanted to. We did find the matching "b" in the book and talked about how the bus starts with the "buh" sound. I introduced the sand tray to Little Bee for the first time using a wooden letter box, white sand, blue buttons, and a fun letter "B" printable hidden under the sand at the bottom. He loved shoveling the blue buttons into the bucket of his tractor. Of course this activity was a big hit with Little Bee because he could make a sandy mess. Actually he did really well at keeping most of the sand in the box. 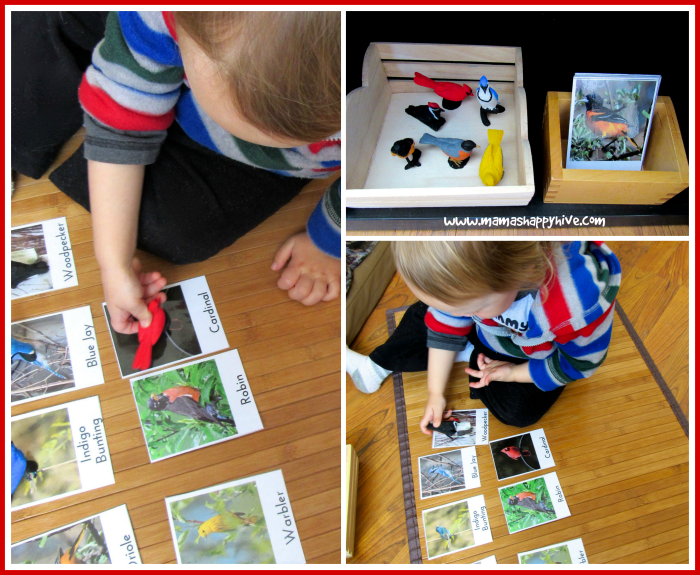 This wonderful free bird printable from The Natural Beach blog combined with the Safari Ltd. TOOB of common backyard birds is a great matching exercise for learning pre-reading skills. Little Bee mixed up the Oriole and Robin a few times, but otherwise he was able to perfectly match these lovely birds to the cards. 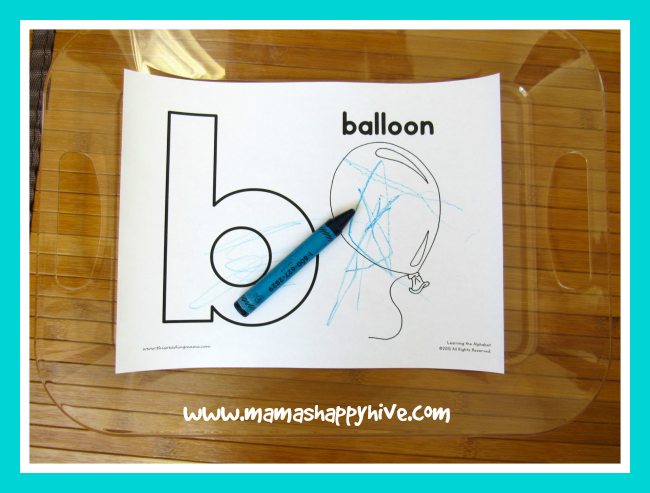 Here is another great letter "b" printable that encourages Little Bee to use his pre-writing skills by giving him an opportunity to scribble. Little Bee and I enjoyed making these letter "b" bumble bees with black and yellow paper, googly eyes, and black pipe cleaners. The bigger b on the left is the one I designed and Little Bee helped to design the smaller b on the right. He practiced using his fine motor skills to tear the construction paper and glue the yellow paper strips onto the black background. 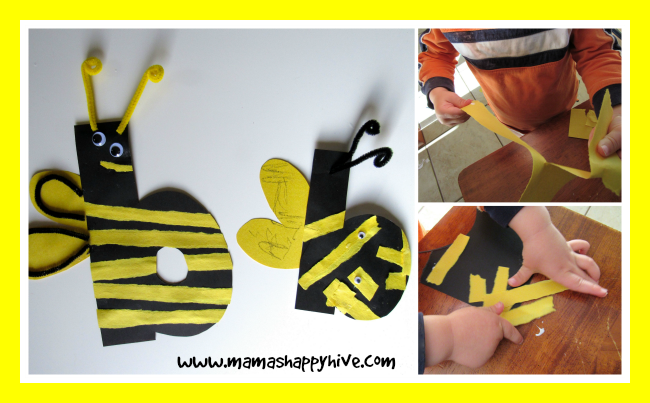 This letter "b" craft was inspired by the Playing House blog - Toddler Crafts. 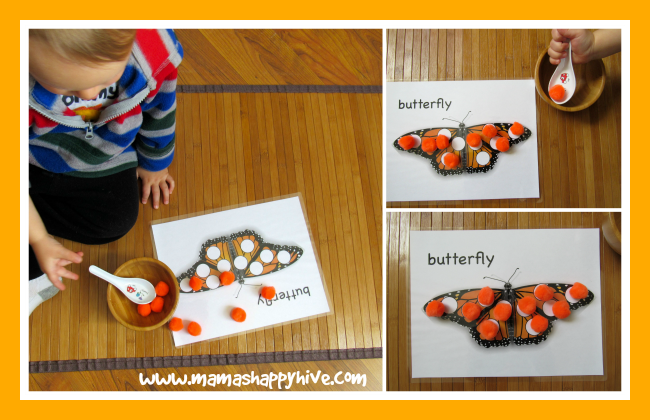 Blue Buttons Transferred onto a Blue "b"
Little Bee enjoyed this beautiful orange butterfly printable as a fun transfer activity using a scoop and pompoms. 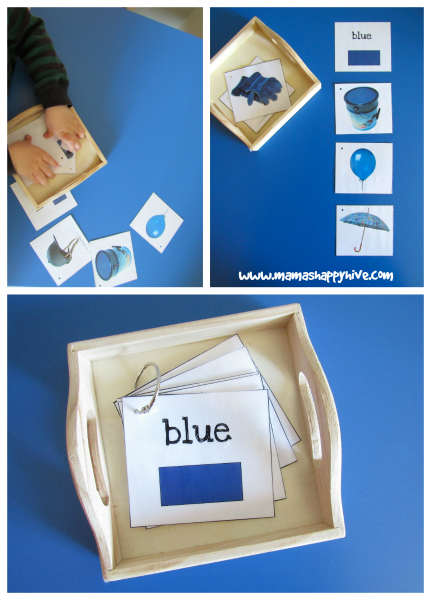 This is a simple sight word printable and I added the objects for a matching game. I emphasized the "buh" sound while working with each card and matching object. On Little Bee's shelves were also a couple treasure baskets with objects that start with the letter "b" sound. 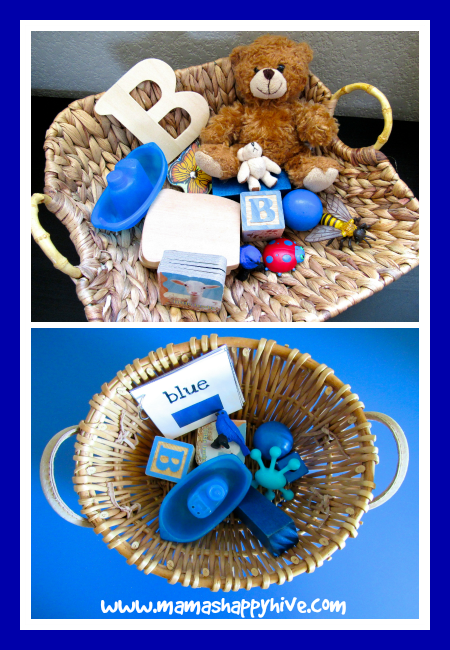 I started with the first basket pictured above and then decided to make an exclusively blue basket with all the objects starting with the letter "b." I had fun finding objects that could be used as an alliteration phrase, such as a blue block, blue boat, blue bird, and blue ball. 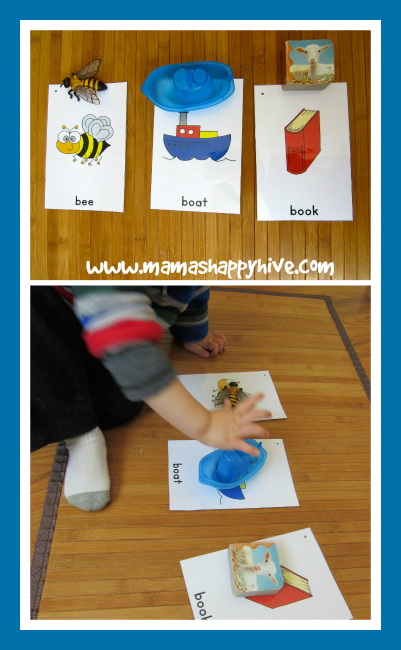 I named each object as Little Bee took them out of the basket and emphasized the "buh" sound. 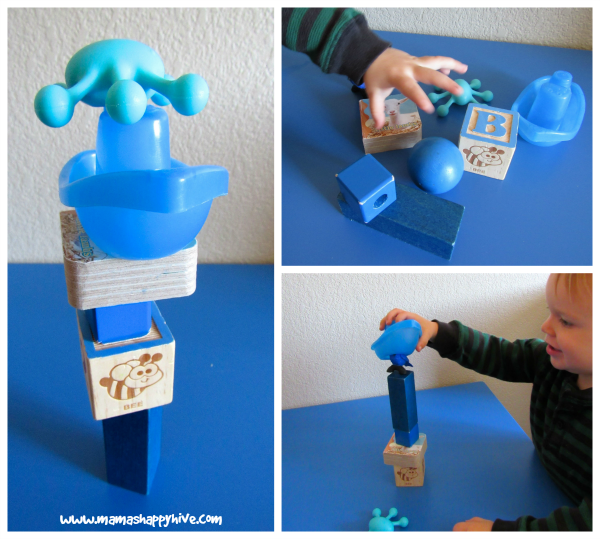 Little Bee enjoyed building a blue tower with the contents of his blue treasure basket. 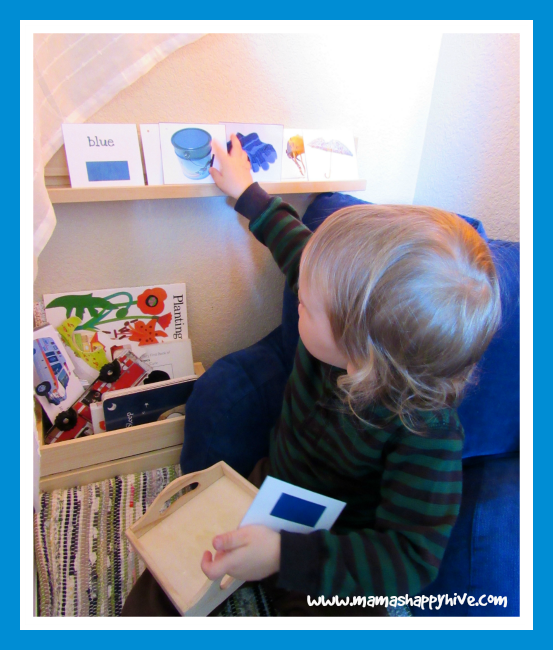 I made an effort to concentrate on the color blue on our "b" Montessori shelves. I thought it would be a good idea to combine Little Bee's learning experiences, especially since we also have rainbow colors on another working shelf in our home. Please visit, Montessori Inspired Toddler Rainbow Unit to learn more. Little Bee enjoyed stacking his blue cards on the shelf while he cozied up inside his Reading Rainbow Closet Fort. Thank you for your visit and please pin this post for later! Follow Vanessa @'s board Montessori Inspiration on Pinterest. I’m always so curious about the way toddler’s minds work! Which activity was B’s favorite, if you don’t mind me asking? Super cute post with so many great ideas! I love it! I’m just about ready to start the letter journey with Sunshine. This was quite inspirational! What a fun series of B activities! 🙂 Thank you for sharing! Love this so much, Will definitely be trying some of these with Ellie! What a great collection of ideas! Little Bee seems so engaged. So many wonderful ideas! I love that you did a letter craft — a craft after my own heart! Of course not Jae! Please borrow away! 🙂 It makes me happy. What wonderful ideas. you put so much work and time into all your lessons. What a great mom! The button transfer was so cool. I also really loved the matching game. So clever! But I’m most excited to try out the sand box. I think we could whip up something similar. Thanks for the inspiration!! I love this! 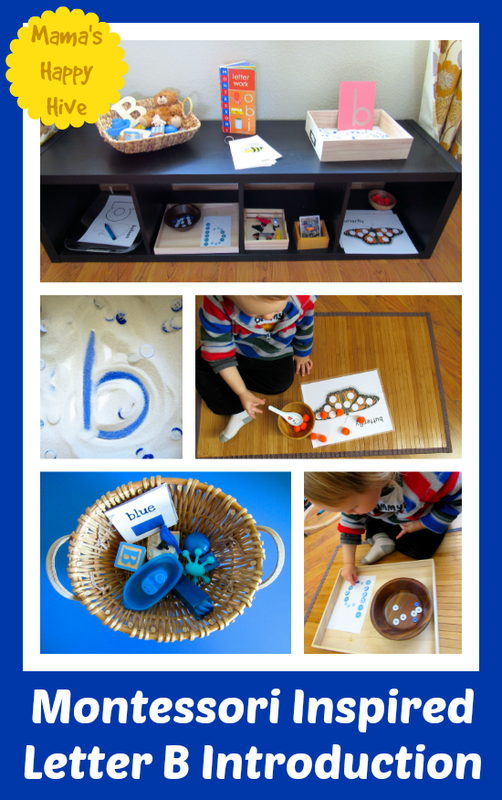 Any child would love sensory, transfer, and crafts to learn the letter B. You always bring such inspiration to our life!